The Sony Ericsson Xperia Ray is now available in the Philippine market for as low as Php16,200. The Xperia Ray is another Google Android phone, running on the Android 2.3 (Gingerbread). It is a rather unique offering. 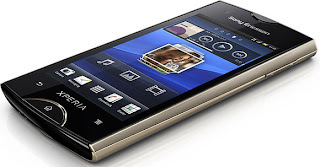 With a high resolution 480 x 650 LCD display, 1GHz Scorpion processor, Adreno 205 graphics and 512MB of RAM, the Xperia Ray's specifications equal or exceed other mid-level Android like the LG Optimus Black, Samsung i9000 Galaxy S and HTC Desire S. The 8MP camera on the Xperia Ray is actually the best in the price range. What makes it different from other mid-level Android is a small 3.3-inch screen. This allows the phone to be built on a small 111 x 53 x 9.4 mm case. Is this the phone for you. I would think most buyers would prefer the larger 3.7-inch screen of the HTC Desire S or the larger 4-inch screens of LG Optimus Black, Samsung i9000 Galaxy S. But if you want a small Android with higher end features than the Sony Ericsson Xperia Ray is the only game in town. Another reason you may want the Sony Ericsson Xperia Ray. Smaller screens mean longer battery life. With a relatively small 3.3-inch display and a 1500 mAh battery, the Xperia Ray should have move endurance than other mid-level Androids.